Entrigue Magazine brings you articles on today's music and dance artist, fashion designers, and rising stars of tomorrow. 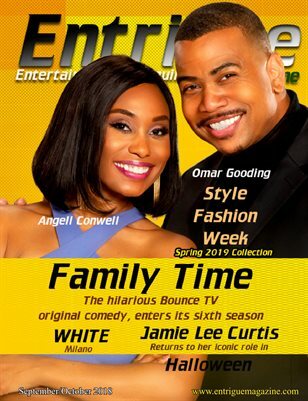 In this issue you'll find Omar Gooding and Angela Conwell, the stars of the hit series Family Time. Also REL featuring Lil Red Howery, Sinbad, and Jess "Hilarious" Moore. Jaime Lee Curtis returns to her iconic role in Halloween, Style Fashion Week, Couture Fashion Week, WHITE Milano, and much much more.